A precast concrete three-sided bridge has an inverted U-shape that’s ideal for spanning small or large waterways. These bridges have the strength of a box culvert but because the base is open, they have a small footprint. 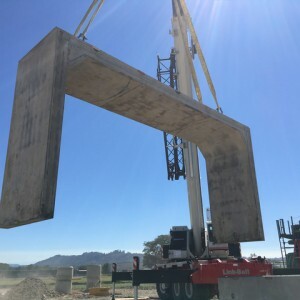 Like box culverts, a three-sided bridge has the load capacity to support the weight of traffic from motor vehicles, livestock or pedestrians. Choose this type of span when you need a design that will have a minimal impact on the streambed below. You can install our bridges in one unit for a smaller stream or combine several for a larger waterway or road. Like all precast concrete products, our three-sided bridges are easy to put in place. The bridge can be positioned and backfilled in one day. Precast concrete’s long-lasting strength makes it an economical choice to replace an aging bridge or build a new span. Our products help public works departments and private contractors reduce the cost of labor and construction. We make these bridges in a variety of sizes and can also design a custom product with the dimensions and features your project requires. What Are the Benefits of Precast Concrete Bridges? Weather and workforce variables won’t delay the construction of your finished three-sided bridge. When the bridge is done, it can be delivered straight to the worksite. We produce a variety of precast concrete products in our Southwest Washington plant. Factory conditions allow our team to regulate temperature and humidity and other factors that influence concrete production. We produce uniformly strong products made in an environmentally sustainable manner. Strength: We design products according to the strength and load capacity you require. If your bridge is destined for a road, path or railway, we’ll build it to meet your project’s needs. Quality: Quality begins with the right design and ends with meticulous construction. Our experienced team builds durable products in factory-controlled conditions. Quick Installation: Products are ready to deliver and place. Order the span you need, and we’ll supply it. When the three-sided bridge is delivered, it can be lowered onto a prepared site. Fewer Delays: Unlike poured concrete, a precast product doesn’t require fair weather. Your bridge is cured and complete before it leaves our factory. Rain and temperature won’t delay your project when you choose precast concrete three-sided bridges. Environmentally Friendly: Concrete is an all-natural product. We strive to recycle materials and conserve resources. Use a precast bridge anywhere you require a short-span bridge. They are the product of choice when you need a bridge that’s strong but has minimal impact on the waterway below it. Columbian Precast Products can assist with installation upon request. Contact us for information about three-sided bridges or any of our other products.